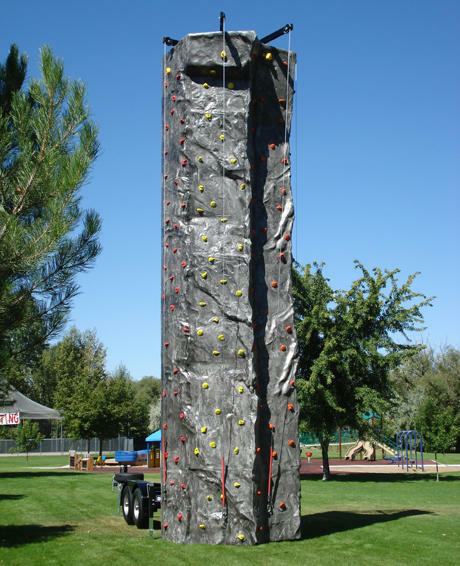 Climbing wall rate is $699 for a 2 hour minimum and $225 each additional hour (Price Includes attendants). . (ask about possible special pricing for tax exempt organizations). 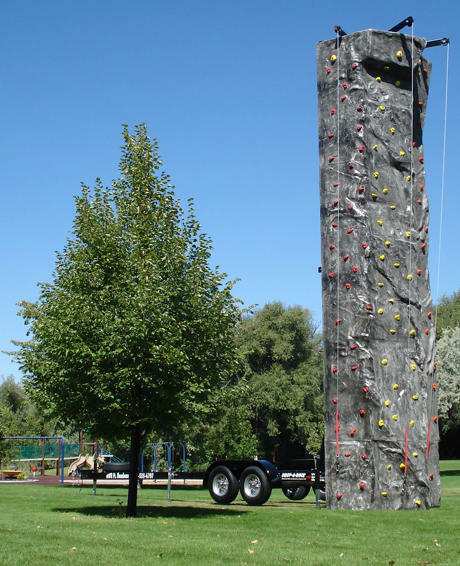 Our portable climbing walls require a level set up area that is between 16-24 feet long x 10 feet wide x up to 29 feet high. The walls must be towed into place with a standard size pick-up truck. Set-up takes only a matter of minutes. Unsure of how our wall will fit into your event area? Xtreme Infltables of LA, LLC. will gladly do a site inspection for an additional fee. Please ensure that you have adequate space before reserving a wall. Xtreme Inflatables of LA Rock Climbing wall is equipped with dual auto-belay system and meets the ASTM standard of safety as set by amusement park industry. The confidence that the Auto Belay gives climbers is instant and incredible; you will find yourself wanting to climb up the wall just for the ride back down. What is an Auto Belay? That is a valid question and is asked on a regular basis. The best way to explain it is to understand the words AUTO and BELAY. Auto is short for Automatic, which means: acting or done spontaneously. The word Belay means: to secure (a person) at the end of a rope. This is accomplished by way of 2 groups of pulleys and cables, being managed by 2 hydraulic cylinders and air pressure and the flow of oil with 2 custom valves that restrict the rate of decent. Oil and air pressure are 2 key items to ensure safe and continual operation / cycles. The Auto Belay safety system is redundant and safe to operate in most conditions. Our amzaing rock wall offers timers on each route so you can have friendly competiton agasint yourself or family and friends.